Growth in the popularity of motorised recreational vehicle (RV) ownership is helping Fiat Commercial expand its business, according to Chris Swann, head of Fiat Commercial operations in Australia. And the introduction of an automatic option in the coming months will also drive up demand. “Having the likes of Jayco, Australia’s number one RV builder, choose Fiat Ducato for its campervans and motorhomes is a tremendous sign of faith in the quality of our commercial vans,” Mr Swann said. “The turbo diesel Fiat Ducato is being used by at least six Australian campervan and motorhome manufacaturers as it already has an established reputation of reliability in Europe among rental motorhome operators and private motorhome owners,” Mr Swann said. 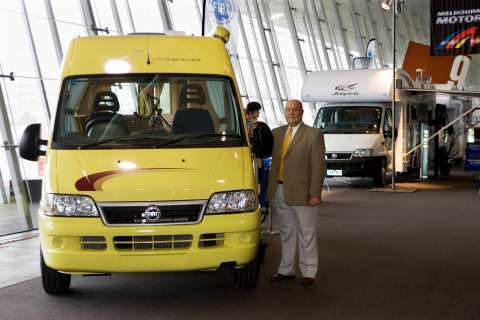 Mr Swann is confident that the demand for the Fiat Ducato-based campervans and motorhomes will increase, once automatic transmission becomes available. The ZF four-speed standard automatic gearbox is only being fitted in Australia and will make it as easy to drive as any automatic family sedan, though it can also be flicked over for complete manual operation. Jayco’s Bruce Astbury said the automatic Jayco Fiat Ducato will be the most cost-effective automatic RV on the market. He said Jayco chose the Fiat Ducato because its popularity in Europe as a campervan and motorhome stemmed from its built-in car-like comforts and Italian flair and its high performing, economical turbo intercooler 2.8 litre diesel engine. “The high roof, wide body and 1,500kg payload were added bonuses, allowing Jayco to install its distinctive luxury furniture and fixtures. Also being front wheel drive gives motorhome builders more design options,” Mr Astbury said. “The vehicle’s performance levels make it easy to drive, with an extremely comfortable driver’s cabin layout. The advent of an automatic will be a real attraction,” he said. Jayco campervans and motorhomes have cruise control included which also makes driving over long distances much easier. Jayco’s response to the demand for motorised RVs has seen Australia’s longtime No. 1 RV manufacturer of caravans, pop-tops and camper trailers, in just 2 1/2 two years become recognised as a premier builder of motorhomes. All Jayco campervans and motorhomes have second stage manufacturers compliance, which guarantees that your RV complies with all relevant Australian Design Rules and Safety Standards. The Jayco campervans also have appropriate seat belt compliance within the van, allowing it to be used for the normal carriage of passengers. Jayco’s 2006 motorised range includes four motorhomes available either in “high roof” or “low roof” configurations and all reflect the luxurious finish that is used in its top-of-the range towable RVs. Jayco’s design expertise comes to the fore in building accommodation modules to the same exact standards applied to its top-of-the-range caravans, released in 2006 as Sterling models. Jayco campervans start at $69,990 and motorhomes start at $92,990 plus on road costs. Jayco’s competitive pricing stems from using high tech state-of-the-art processes, including computer-driven engineering systems and the experience it has gained in over 30 years of RV manufacturing this year. The look of the motorhome is extraordinary as it has an automotive finish, developed from using Jayco’s Tough Frame construction methods of sandwich panelled walls, that have a high-gloss, almost dent resistant sheer, fibreglass finish. New 2006 striping and decals add to the automotive styling.